Blueberries are sweet and healthy, and are loaded with antioxidants called flavonoids. Antioxidants help protect your body from free radicals. I like adding blueberries to my cereal, yogurt, waffles, salads, and baked goods like scones and muffins. Simply put, blueberries are a healthy snack. 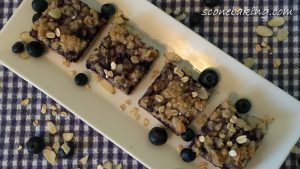 Not only do these delicious Blueberry Streusel Bars have healthy blueberries, but I also added healthy oatmeal to the streusel topping. 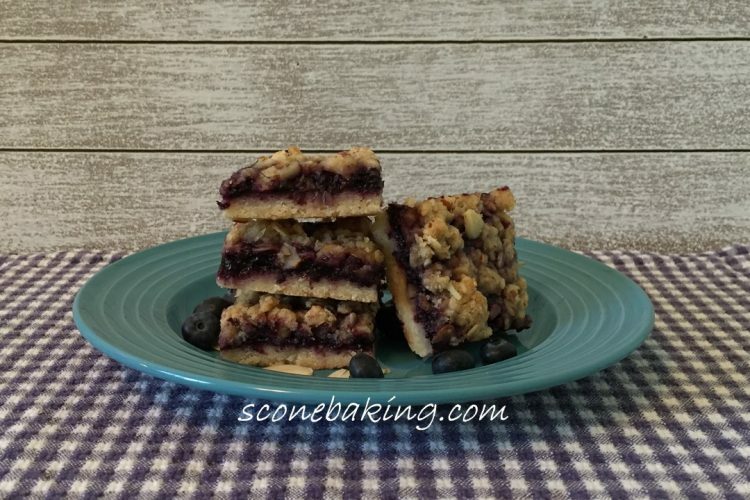 These yummy Blueberry Streusel Bars are loaded with blueberries. And, to add more blueberry flavor I added blueberry preserves and freeze-dried blueberries, which I pulverized into a powder. 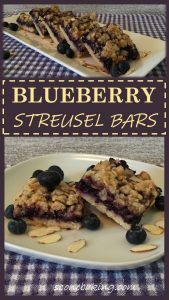 I guess you could call these Triple Blueberry Streusel Bars. Preheat oven to 375 degrees F. Make a parchment paper sling for 13 by 9-inch baking pan by folding 2 long sheets of parchment paper; first sheet should be 13 inches wide and second sheet should be 9 inches wide. Spray bottom, corners, and sides of pan with cooking spray, lay wide (13-inch) sheet of parchment paper in prepared pan, push paper up sides of pan with extra hanging over edges of pan. Spray parchment paper in the pan with cooking spray, lay narrow (9-inch) sheet of parchment paper perpendicular to wide sheet, push paper up sides of pan with extra hanging over edges of pan. In a large mixing bowl, whisk together flour, granulated sugar, and salt. Add butter; using your hands blend together until mixture resembles cornmeal. Transfer 1¼ cups (144 grams) of the flour mixture to another large bowl; set aside. Transfer remaining flour mixture to prepared pan, using your hands to evenly distribute it over bottom of pan. Firmly press dough into even layer. Bake at 375-degrees F. until light golden brown, 16 to 18 minutes, rotating pan halfway through baking. In a food processor add oats and almonds, pulse 6 times to lightly break up oatmeal and almonds; add to reserved flour mixture in a large bowl; whisk in brown sugar until combined. Add butter and rub mixture between your fingers until butter is fully incorporated and mixture forms small clumps. Set aside streusel topping. In a clean food processor pulverize 2/3 cup of freeze-dried blueberries; put through sieve to get 2 Tablespoons (put any extra pulverized blueberries back into package for a later use). Pulse together 2 Tbsp. 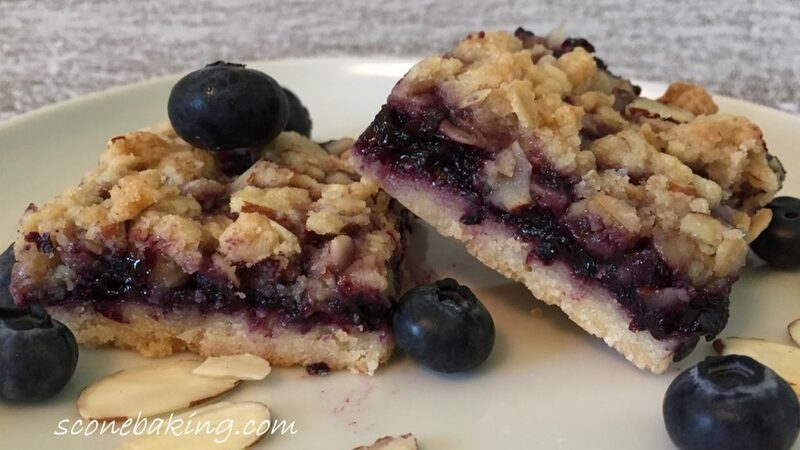 pulverized freeze-dried blueberries, fresh blueberries, blueberry preserves, lemon juice, almond extract in food processor until finely chopped, about 7 pulses; set aside. Spread blueberry filling evenly over cooked crust (crust doesn’t need to be cooled). Sprinkle streusel evenly over filling (do not press streusel into filling). Bake until filling is bubbling and streusel is deep golden brown, 24 to 28 minutes, rotating pan halfway through baking. Transfer pan to wire rack and let bars cool completely. Using parchment paper overhang, lift bars out of pan, cut into 24 bars. Serve and enjoy!